It’s July, and I’m on vacation! I’ve never been to the State of Washington before, and I’m staying in Port Angeles tonight. 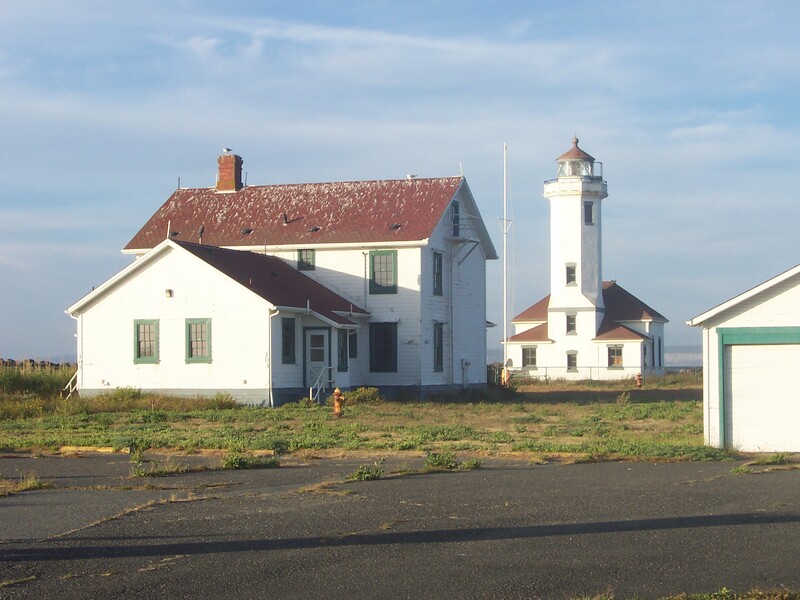 Port Angeles is the most popular town for people to stay in before driving into Olympic National Park. My husband and I drove through Bend, Oregon a few days ago. 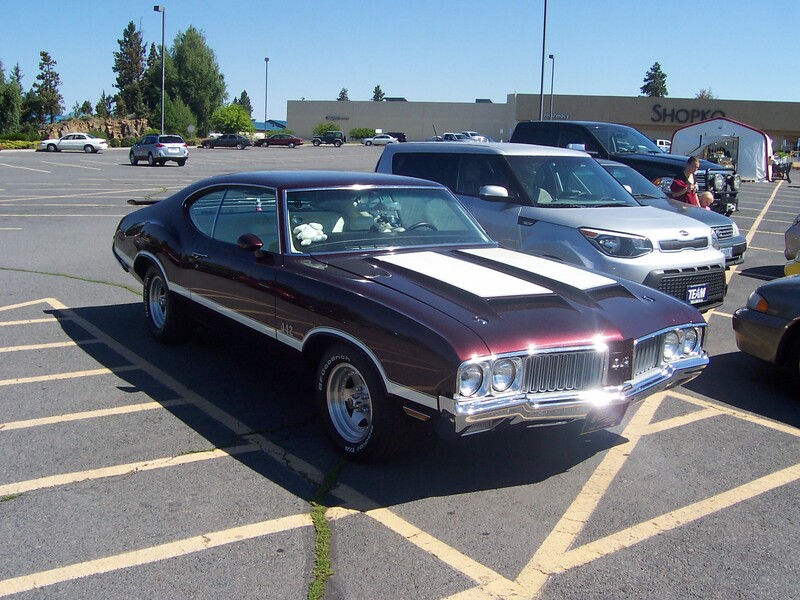 Look at these cool cars I saw outside the IHOP in Bend! What a gorgeous Mustang GT, yes? Muscle cars are just SO beautiful. So pretty I ache sometimes to look at them. I couldn’t tell you which has the bigger engine– that GT or that 442– but I admire people who memorize that information. I love gorgeous muscle cars but I don’t love owning them or driving them. I like them as fantasy. 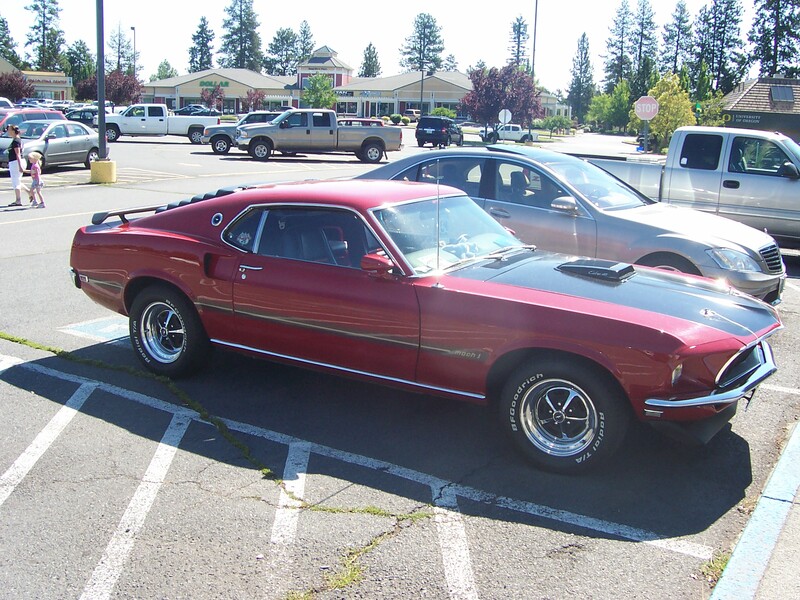 I prefer muscle cars to be like faeries in the forest– pretty and elsewhere– and not in my garage. Nowhere near my garage. These are coffee mugs for writers. 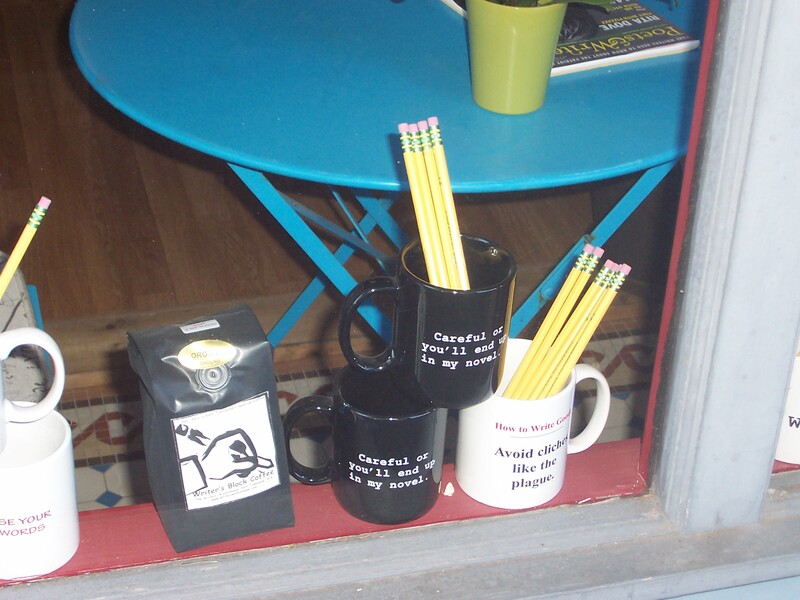 The two black mugs say, “Careful or you’ll end up in my novel” and the white mug says, “Avoid clichés like the plague.” The little bag of coffee beside them is (I think) called “Writer’s Block Coffee” and the other white mug says, “Use Your Words.” It was a fabulous bookstore, with many more mugs on display inside, an excellent selection of books and journals, and a small children’s room. The sun was going down, but you can see how brown the grass is. Greg says they are in a drought here. 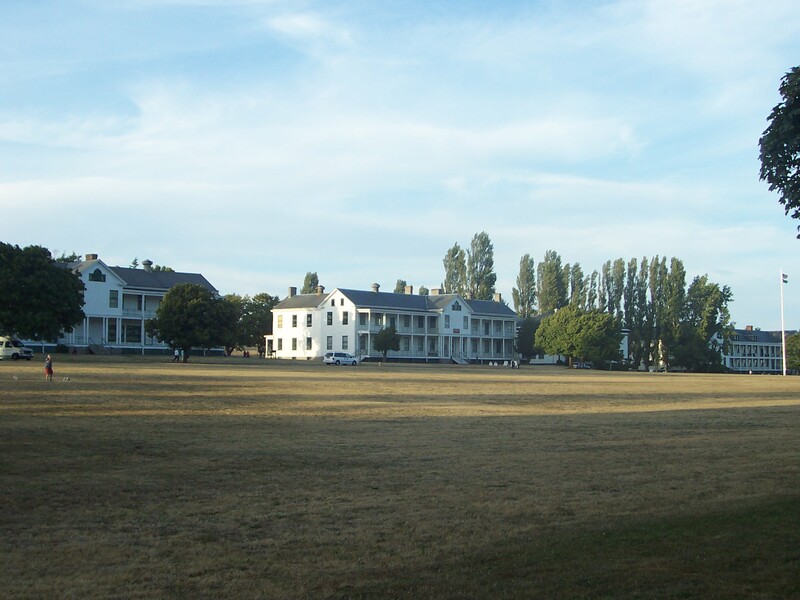 Fort Worden was built in 1900, one of three major fortifications constructed on Puget Sound to defend the area from enemy attack. It now serves as a recreation, lodging and arts center, and Greg was glad to see these buildings weren’t torn down, but refurbished. I’m not really a cemetery girl, I don’t often visit gravesites, but every now and then, it seems like an interesting thing to do. I failed to bring my lucky red sweater with me on this trip, and I am really missing my sweater tonight. It was 61 degrees here at 8:30 p.m.– my bare legs were not happy with me. The 100-degree heat of eastern Oregon is long gone, as is the 85-degree heat of downtown Portland. I didn’t realize how cold Port Townsend and Olympic National Park would be– mostly because I had no idea where we were even going when we left home on Saturday. Now I know. And it’s cold here. Silly me, I packed for summer heat. Dang! That didn’t stop me from eating locally-made ice cream in Port Townsend today. Lavender Lemon Custard. Divine! Worth the shivers.